VietPress USA (June 17, 2018): More than 2,000 children have been removed from their parents over the last six weeks since Jeff Sessions, the US attorney general, introduced the new approach. Under the policy adults are being detained and prosecuted with their children taken away and sent to separate shelters. Previously, many illegal immigrants were allowed to remain at liberty while they awaited proceedings. According to the Telegraph News, Laura Bush was writing a guest column for The Washington Post Sunday and compared the policy to the internment of Japanese Americans during World War II. "I appreciate the need to enforce and protect our international boundaries, but this zero-tolerance policy is cruel," the wife of George W Bush wrote. She said "the US government "should not be in the business of warehousing children in converted box stores or making plans to place them in tent cities in the desert outside of El Paso." The US Border Patrol on Sunday allowed reporters to briefly visit the facility where it holds families arrested at the border. President Trump blamed Democrats that caused th families separated at US-Mexico border; but the Fact check from Media confirmed that Trump declared the wrong thing to defend his policy. Melania Trump waded into a debate over children being separated from their families at the Mexico border, saying the United States should "govern with heart". In a rare intervention the first lady's spokeswoman said she wanted Republicans and Democrats to work together to achieve "successful immigration reform". Her comments were taken by some as an implicit criticism of her husband's recently introduced "zero tolerance" policy at the border. 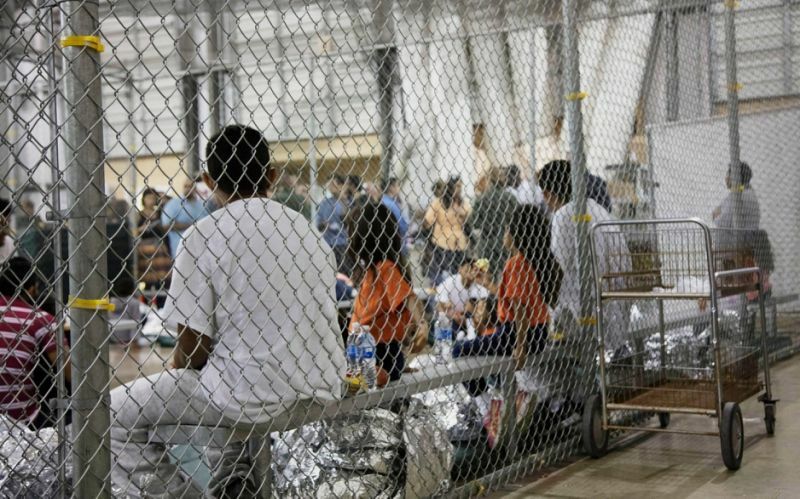 The US Border Patrol on Sunday allowed reporters to briefly visit the facility where it holds families arrested at the southern US border, responding to new criticism and protests over the Trump administration's "zero tolerance" policy and resulting separation of families. Stories have spread of children being torn from their parents' arms, and parents not being able to find where their kids have gone. A group of congressional lawmakers visited the same facility on Sunday and were set to visit a longer-term shelter holding around 1,500 children - many of whom were separated from their parents. "Those kids inside who have been separated from their parents are already being traumatised," said Democratic Sen. Jeff Merkley of Oregon, who was denied entry earlier this month to children's shelter. "It doesn't matter whether the floor is swept and the bedsheets tucked in tight." In Texas' Rio Grande Valley, the busiest corridor for people trying to enter the US, Border Patrol officials argue that they have to crack down on migrants and separate adults from children as a deterrent to others. Agents running the holding facility - generally known as "Ursula" for the name of the street it's on - said everyone detained is given adequate food, access to showers and laundered clothes, and medical care. People are supposed to move through the facility quickly. Under US law, children are required to be turned over within three days to shelters funded by the Department of Health and Human Services. An advocate who spent several hours in the facility on Friday said she was deeply troubled by what she found. "She was so traumatised that she wasn't talking," Brane said. "She was just curled up in a little ball." Brane said she also saw officials at the facility scold a group of five-year-olds for playing around in their cage, telling them to settle down. There are no toys or books. "The government is literally taking kids away from their parents and leaving them in inappropriate conditions," Brane said. "If a parent left a child in a cage with no supervision with other five-year-olds, they'd be held accountable." Dr. Colleen Kraft, the head of the American Academy of Pediatrics, said she visited a small shelter in Texas recently, which she declined to identity. A toddler inside the 60-bed facility caught her eye - she was crying uncontrollably and pounding her little fists on mat. Staff members tried to console the child, who looked to be about two years old, Kraft said. She had been taken from her mother the night before and brought to the shelter. The staff gave her books and toys - but they weren't allowed to pick her up, to hold her or hug her to try to calm her. As a rule, staff aren't allowed to touch the children there, she said.